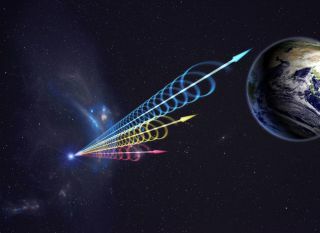 An artist's illustration of emissions from a fast radio burst reaching Earth. The different colors signify different wavelengths of light. Fast radio bursts (FRBs) may not remain mysterious for much longer. FRBs are brief but incredibly powerful phenomena; the milliseconds-long emissions are energetically comparable to the total output of our sun over a century. But, as Stairs noted, FRBs are as enigmatic as they are spectacular. Astronomers have offered a number of possible explanations for the bursts, including merging neutron stars and advanced alien civilizations. The new results — which were announced today (Jan. 9) in two papers in the journal Nature, and in presentations at the 233rd American Astronomical Society meeting in Seattle — aren't great news for anyone holding out hope that E.T. is responsible. The more common a phenomenon is, after all, the more likely it is to have a natural explanation. The discovery team analyzed observations by the Canadian Hydrogen Intensity Mapping Experiment (CHIME), an advanced new radio telescope in British Columbia's Okanagan Valley. "CHIME reconstructs the image of the overhead sky by processing the radio signals recorded by thousands of antennas with a large signal-processing system," team member Kendrick Smith, of the Perimeter Institute for Theoretical Physics in Ontario, said in the same statement. "CHIME's signal-processing system is the largest of any telescope on Earth, allowing it to search huge regions of the sky simultaneously." And CHIME wasn't even fully up and running when it made the new detections. The 13 FRBs were spotted over the course of a few weeks in July and August 2018, during CHIME's "precommissioning" phase. The repeater was studied for a spell beyond that; the last of its six known flashes was observed in late October, team members said. The repeater, known as FRB 180814.J0422+73, lies about 1.5 billion light-years from Earth, the astronomers determined. That's about two times closer than the other repeater, FRB 121102, which is known to have fired off dozens of bursts over the past few years. Canada's CHIME radio telescope (seen at night here) recently detected 13 mysterious fast radio bursts (FRBs), including just the second known repeating FRB. Most previously detected FRBs feature radio frequencies that are around 1,400 megahertz (MHz). CHIME's range is much lower, from 400 to 800 MHz, so the new discoveries are shedding considerable new light on FRBs. Astronomers now know that FRB "sources can produce low-frequency radio waves, and those low-frequency waves can escape their environment and are not too scattered to be detected by the time they reach the Earth," CHIME team member Tom Landecker, from the National Research Council of Canada, said in the same statement. "That tells us something about the environments and the sources," Landecker added. "We haven’t solved the problem, but it’s several more pieces in the puzzle." You can find the newly published Nature papers here and here.